Tamil Nadu Dr Ambedkar Law University and Rajaji Center for Public Affairs conducted the 7th Annual RM Seshadri Memorial Lecture on ‘Empowerment Of Women’ on Saturday Feb 13th, 2013. There were more than 100 guests including women from eWIT attended this event. The main speakers were Hon’ble Justice Ms. Prabha Srideven and Mrs. Kalyani Narayanan, President, eWIT. 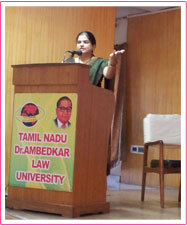 Ms. Kalyani Narayanan, President of eWIT spoke on ‘The Female Work Force – A perspective’. The speech was around the current status of women in our country. For example, India stands at 107th in Gender Gap Index among 137 countries assessed. She also discussed what the society, Government, Corporate and the Women must accomplish through various phases of progress that would take them from ‘Novice’ state to ‘Arrived’ state in building a Gender Inclusive nation. She said that the most challenging is the changing the Societal outlook on gender equality. It has to start from childhood where parents bring up their children, both sons and daughters, consciously nurturing gender equality among them. Hon’ble Justice Ms. Prabha Srideven shared her judgments on women rights she made while serving in the Madras High Court Interestingly, she went back to college to study law and became a judge after spending 13 years after marriage as a home maker. The importance of marriages be registered as soon as it takes place in order to establish legality and rights of the wife. The value of the home maker. That is the services that a wife as home maker performs has value that can be calculated from several angles. She talked about this judgement as a proud moment in her career because the Delhi High Court directed to follow this judgement for a similar case later on. Mr. Narayanaswamy, Guest of Honor and Mr. Dr Reddy of TN Dr Ambedkar Law University also stressed upon the need for the empowerment and equality of the women in our country and also mentioned that women students are 52% in law colleges and perform much better than the male students. Mr. Venkatakrishnan, son of Mr. RM Seshadri, gave vote of thanks.